Caesalpiniaceae - Bauhinia, Caesalpinia, Cassia, Cercidium, Cercis, Delonix, Gleditsia, Gymnocladus, Hoffmannseggia, Parkinsonia, Senna, Tamarindus, etc. Fabaceae - Amorpha, Arachis, Astragalus, Baptisia, Canavalia, Caragana, Cicer, Cladrastis, Clitoria, Coronilla, Coursetia, Crotalaria, Cytisus, Dalea, Desmodium, Dolichos, Erythrina, Eysenhardtia, Genista, Glycyrrhiza, Indigofera, Lathyrus, Lespedeza, Lotus, Lupinus, Medicago, Melilotus, Millettia, Oxyrhynchus, Oxytropis, Pachyrhizus, Petalostemon (Petalostemum), Phaseolus, Psoralea, Robinia, Sesbania, Sophora, Tephrosia, Trifolium, Vicia, Vigna, Wisteria, etc. Mimosaceae - Acacia, Albizia, Calliandra, Desmanthus, Enterolobium, Havardia, Inga, Leucaena, Lysiloma, Mimosa, Pithecellobium, Prosopis, Samanea, Schrankia, etc. for central & south Texas. Caesalpinia cacalaco - Cascalote - Tender Perennial but usually a large deciduous shrub after most winters. Plant in full sun where its showy thorns can be seen backlit. Caesalpinia japonica - Scandent Shrub - We have had it climb over 20 feet high if supported. Very spiny and useful for a security barrier. 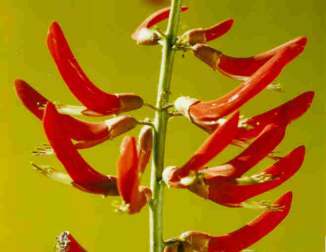 Erythrina X bidwillii - Hybrid Coral Bean - Perennial - An extraordinary and spectacular perennial for full sun, which blooms from May until first freeze. The long, tubular flowers are a brilliant red and occur in spikes at the top of 6- to 8-foot stems. Once established, it requires no supplemental irrigation. Being a legume, it never needs to be fertilized. The only maintenance required in cultivation is to cut everything off at 4-inches above the soil-line after the first freeze. Their recovery is rapid in spring. The plants should be cut back even after a very mild winter to prevent them from reaching arboreal proportions. It is the best natural hummingbird feeder for central & south Texas.